TP-LINK’s Wireless N Powerline Extender Starter Kit extends an Internet connection to every room of the house over existing electrical circuitry. All devices in the room have two options to get access to TL-WPA281, whether through wireless or using an Ethernet cable. With 200Mbps Powerline link rate and 300Mbps wireless N rate, it is ideal for bandwidth consuming or interruption sensitive applications like video streaming, online gaming and Internet calls. With TL-WPA281, Internet can be available everywhere in your house. With advanced HomePlug AV technology, TL-WPA281 Starter Kit provides users with stable, high-speed data transfer rates of up to 200Mbps on a line length of up to 300 meters. Together with its built-in Qos and powerful AES encryption, the TL-WPA281 is a great choice for a whole home solution to connect all network compatible devices--from computers and game consoles to set-top boxes for IPTV to printers and NAS hard drives. With wireless speeds of up to 300Mbps, users can effortlessly extend their network via the existing powerline and broadcast a wireless signal to another area of their home or office. 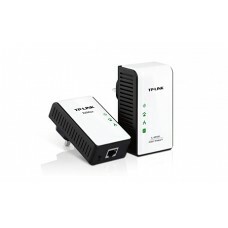 200Mbps powerline and 300Mbps wireless ideal for lag-sensitive applications. Simply by pushing the Pair button on the adapters, users can set up a hassle-free Powerline network within minutes, complete with 128-bit AES encryption for network security and data protection. It's that simple! Compatible with Wi-Fi Protected Setup™ (WPS), TL-WPA281 Starter Kit features WPS One Button Security Setup that allows users to almost instantly setup their security simply by pressing the "WPS" button on the adapter automatically establishing a WPA2 secure connection, which is more secure compared with WEP encryptions. Not only is this faster than normal security setups but more convenient in that you don't need to remember a password! Quality of Service (QoS) function prioritizes the bandwidth requirements of data traffic. Users can choose which type of traffic they will use -- Internet, Online Game, and Audio or Video, Voice over IP, and the QoS functions will guarantee clear, instant reproduction of that application, even when other applications are running on the network at the same time.